I sort of went on 3 different phases while I was doing this wall: the first one, the vectoring, I worked pretty fast on the outlines and I made sure they looked decent before painting. The second one and maybe the longest: figuring out how to paint. Seriously. I totally forgot how to do it. I tried different things and they failed, I mean, I couldn't get the look I was aiming for. Then, I tried multishading, like a sort of vexel, it didn't came nice either. So, in the end, I got very frustrated and I kinda dropped the wall. I even did the Echo wallpaper in the meantime. After that, I tried SAI (Vitaamin: I still can't use that thing ;__;) I even looked for different tutorials on the subject but they weren't useful....or I didn't read them with the enough attention. *rolls eyes*. But then, I discovered that I really could paint and I give it a shot and I think I made it : D.
Well, it's CG....and it's Lulu...or depressed Lulu as Kitten called it xD and it's so lame that's a CG wall, but I just can't help it! I adore that scan. I feel I should explain the title maybe...Viva la Vida as in the Coldplay song. The lyrics of that song fit so well with Lulu's story, and I'm not going to give any details since I don't want to spoil anyone. Just google the lyrics and think of it. And it's one of my favorite songs too <3. Oh well, the scan is here, the painted vector will be at EDD (as well as other resolutions) very soon. keep the plain look with the clouds and fire sparks. Too Beautiful! I am awed by this! Great job! Love the painting! Aaaah, Lulu's hands are so freaky D: (not your fault). waaaaaahhh finally a new wallpaper again :) i totally love it ! esp the painting... the facial expression of lulu is great >.< ! lelouch .just amazing .i really liked his personality . Lelouch T^T looks so sad in this pic. Great vectoring and use of textures. this song so suits him! for those who have seen the whole series look up an amv called "Requiem for the God Emperor" it's so good and the song is Viva la Vida! 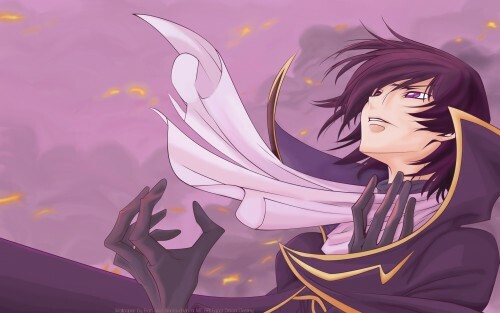 Wow Lelouch looks great XD. I really love your work. It's neat & attractive. OMG. thats totally good! Cg is great, Lelouche is awesome and this picture is the greatest! Nice painting! It makes me think of grapejuice... I love Lulu. excelente CG! +1fav for that reason. Nice wallpaper, it is simple and beatiful. Very good job.